Physical: geographic-north.com/cassette/slow-day-on-brilliant-drive/ Digital: geographicnorth.bandcamp.com/album/slow-day-on-brilliant-drive Catalog #: GN50 Cassette, limited to 100 Los Angeles-based DJ and composer Nick Malkin is perhaps best known for his noirish, backlit ambient dance music under the name Afterhours (Not Not Fun). Malkin’s also moonlighted as a casual collaborator with LA Vampires and Sun Araw, served as an early DJ with Chinatown-based experimental radio station KCHUNG, and currently hosts a radio show of atmospheric selections on NTS radio called Post-Geography. 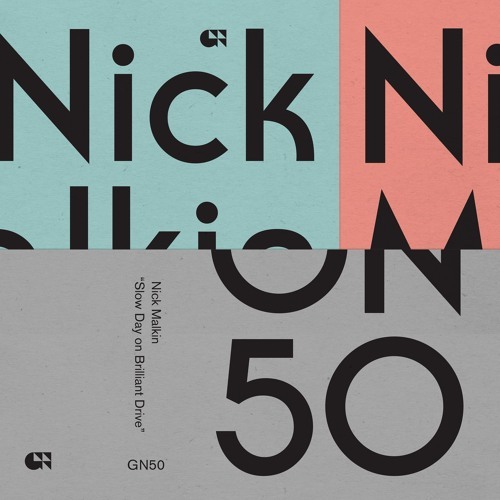 Now, Malkin returns with 'Slow Day on Brilliant Drive,' his most radiant work to date. Along with Maxwell Sterling (double bass) and Jon-Kyle Mohr (percussion), Malkin self-instituted an intricate form of collaboration that required extensive amounts of improvisation, meditation, and editing. Malkin introduced a curated series of loops to his collaborators, who then embellished them with textures and muted motifs. Malkin then laid everything out and went to work scouring, polishing, and re-contextualizing certain elements into something entirely new, with elements within dating back to 2014. The end result is a profound live-band ambient record that celebrates a curated but communal musical dynamic, along the lines of The Necks or Supersilent but heavily informed by the micro-delicacy of Mille Plateaux’s most fathomless works. Even with the highly disparate sound sources, 'Slow Day on Brilliant Drive' is a deeply cohesive and surprisingly intimate work that speaks to Malkin’s uncanny ear and devotion to a concept.